A classic favourite updated for 2019, the Cross AIR remains a stable in the Travel Pod range. Utilising the Kampa AirFrame, the Cross AIR features a sturdy and spacious living area and benefits from new steeper walls to offer improved headroom and useable space. Redesigned, the front panel now incorporates an easier to use ‘D’ door that can be half or fully rolled back, all covered by large front canopy for weather protected access to the awning. 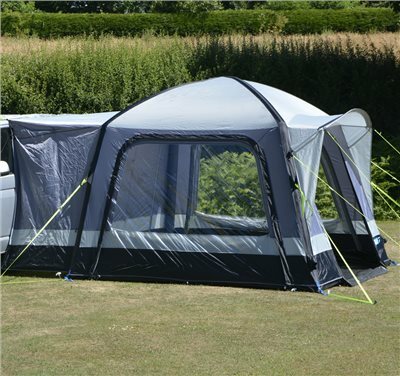 The Cross AIR comes with a clip- in groundsheet that can be removed when required and features large windows with blinds for added privacy and mesh throughout for plenty of ventilation. An optional two-berth inner tent can be added to either or both sides of the awning.